The second very cool thing...there is a BIG quilter's retreat here that goes all out. It's kind of spendy and I haven't gone before. I was contacted and asked if I would like to be the official massage therapist for the retreat..a personal invitation! I said I would, if I could be guaranteed enough clients to cover the cost of my lodgings. I just heard back that several people have paid their registration, and my fee for the massage on the form, and so I get to go to the retreat EXPENSES PAID! 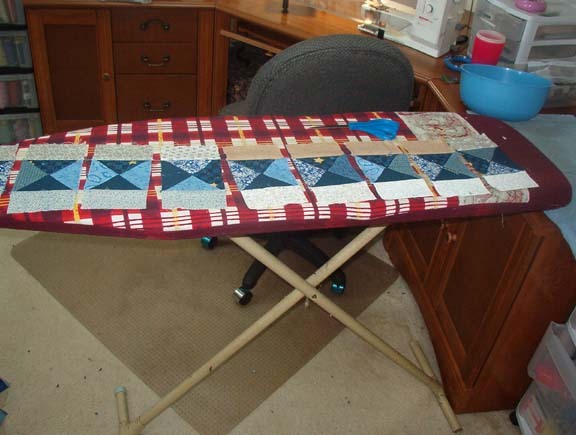 A little massage work on the side, and the rest of the time I get to spend quilting with everyone else. How cool is that?! The massages I have reserved so far will cover the cost of a little cottage room all to myself. It is Feb 22nd to 25th. So I have that in the works. The third cool thing, okay so I didn't mention that in the title...this past weekend was the MS-150 ride for Multiple Sclerosis. With your help we raised over $2060.00 to fight MS. I had a great time working on the cyclists saturday and sunday. I was SO BEAT by the time I was done, but it was so worth while. I mean, what's better than guys in spandex bike shorts? :cÞ No really, it was wonderful, uplifting, and most of all FUN. 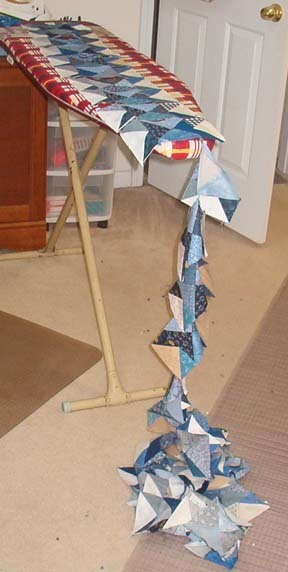 I haven't had time to work on my blue/neutral quilt....and it's driving me crazy. I have so many customers to finish quilts for and the pressure is ON. 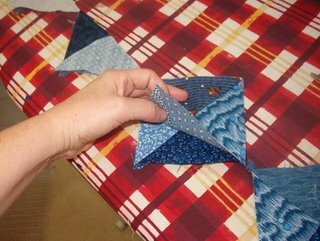 So...That pile of 1/2 sq triangles are going to have to sit there at the machine table for just a while longer while I get caught up on stuff. Life gets in the way, you know?! Quipped by Bonnie K. Hunter at 9:51 AM 17 Snips & Comments by others! Thursday.....it's cool and the windows are open! Oh, I am SO enjoying this cooler weather. You are probably tired of hearing it...but when you have been without it so long, you just embrace it like a lost friend! Yesterday it poured and poured...that was NOT fun to drive in, but today, it is overcast, very green....nice gentle breeze..and I have the windows open letting some fresh air in here. It's nice when the a/c stops running 24/7 and I don't have to breathe processed air! This real stuff with lower humidity is great! It's been a crazy week so far so I haven't gotten as far as I would have liked to with my power sewing. I spent some time this morning, and I have gone as far as I can. Now I have the job of 180 1/2 sq triangle squares ahead of me, so that needs some concetrated time before I see any more 'real' progress on this thing. And I couldn't resist taking a picture of Oscar as he auditioned the pile of blue strips. I think he approved! Quipped by Bonnie K. Hunter at 11:45 AM 18 Snips & Comments by others! Tuesday, feeling almost like fall! You can't believe what a break it is when it starts to be a bit cool and less humid in the mornings in South Carolina! It's been GORGEOUS the past few days...yes! Come on FALL! With fall brings the desire to pull out the crockpot for some wonderful soups that simmer all day long, whole wheat bread dough rising in the bowl, and hot cereal for breakfast with brown sugar, cinnamon, raisins and milk...comfort food! I just can't cook like this in the summer...it's usually too hot to even want to drink hot tea in the mornings. Once school starts and things settle in, I hanker for my tea pot and the smell of tea steeping as well. I have another little picture for you! Let's see..what have I done so far? 90 hour glass units....turning 1/2 of them into puss in the corner type blocks....and now..180 flying geese units! 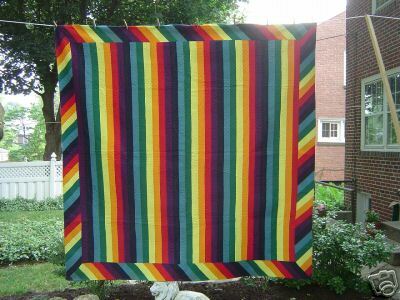 Some quilts just require building one block at a time so you can match colors and get things just so. 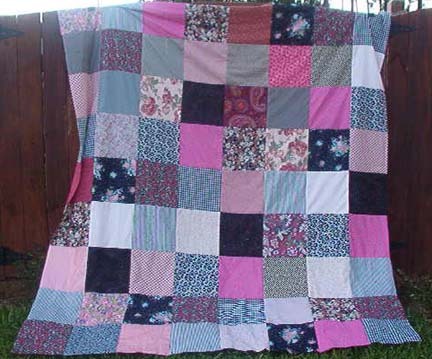 Other quilts...like this one...just call for what I refer to as POWER SEWING! Figure out how many units you need, and just chain them through the machine in mile long strings of pieces. 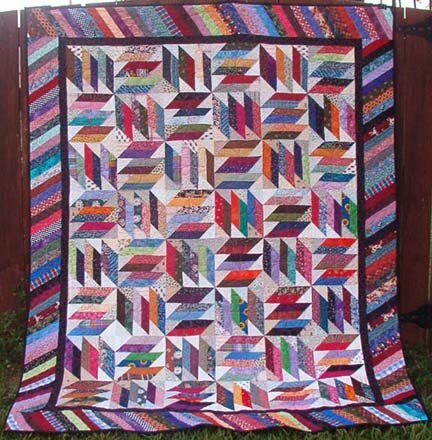 THIS is that kind of quilt! Now that I've finished the fying geese units, I need to make 180 1/2 square triangle squares, blue and neutral. It's a daunting task, but with power sewing, books on CD, or music from XM radio 70's channel blaring, I can get it done in no time! Quipped by Bonnie K. Hunter at 8:09 AM 19 Snips & Comments by others! I worked Saturday (yesterday) doing massage, and after I got home I was just beat...I did finish a customer's quilt that has to be delivered to guild meeting in Aiken tomorrow, but no time to play with my own fabric! Today I treated myself to a LONG Sunday nap. Sundays were meant for napping I think. I just need it to catch up and recharge myself for the next week coming, and if I don't get my Sunday afternoon nap, I'm just not a happy girl! 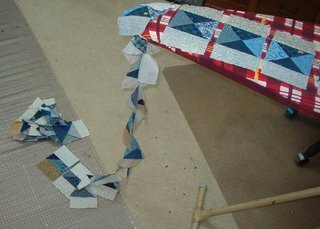 Some of the steps could be simplified if you were to speed piece with long strips and rotory cut across panels, but sometimes I like to just chain feed individual pieces and pairs through and get more variety in my piecing instead of having sections that all look the same because you used long strips to create them, you know what I mean? Anyway....stay tuned...keep guessing...I'm back to sewing! Quipped by Bonnie K. Hunter at 3:53 PM 10 Snips & Comments by others! As for what I'm making? I'm not tellin! :c) You'll have to wait and see! 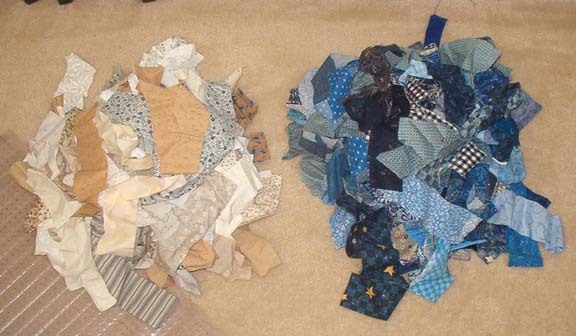 I pulled out all the blue and neutral 2.5" strips into two piles and I've got PLANS!! Quipped by Bonnie K. Hunter at 9:17 AM 22 Snips & Comments by others! 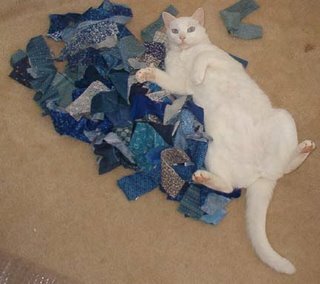 How much does your fabric weigh?!? wall where my cabinets *WERE* was above the garage door below. cabinets against an outside wall would be too much unsupported weight. to the second level, so maybe it can't support as much weight. stash and the cabinets, even across the room. Paralyzed by the stash?? You bet! Quipped by Bonnie K. Hunter at 6:58 PM 15 Snips & Comments by others! I have added the directions for "Weed Whacker!" to my website! 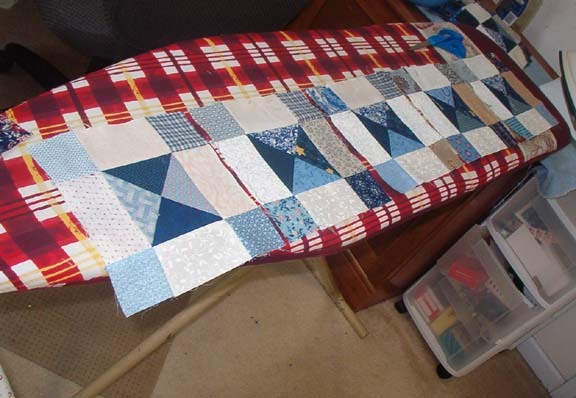 There are no pics of the finished quilt yet....I'm quilting the last border, and then will start the binding! 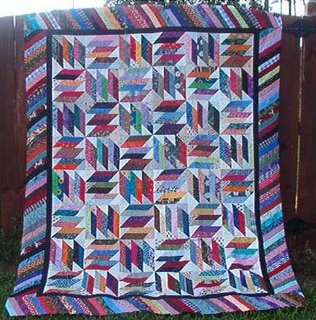 I'll add more pics to the page when I have the quilt finished...but in the mean time, there is no reason why you can't get started on your blocks! I also wanted to thank all who have pledged to the Multipe Sclerosis Society's MS-150 ride! Thanks to your pledges we have raised $1,685.00 to help find a cure for MS! We couldn't do it without you. You are terrific! The ride is in 2 weeks, September 16th and 17th. DH is riding, and I'm doing massage on the riders for the 2 days of the ride. If you haven't pledged yet and would still like to contribute, all the information is on the Quiltville page. Quipped by Bonnie K. Hunter at 7:50 PM 11 Snips & Comments by others! I'm using a fuscia thread in the dark areas...and a varigated pastel in the lights. It's a superior varigated and it is ANYTHINTG but superior. It breaks and breaks! 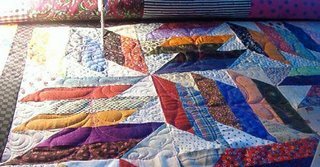 :c( I've messed with tension and everything..changed needle....it quilts fine with the solid fuscia, but this superior is (*&@#$(*&$&! Quipped by Bonnie K. Hunter at 11:57 AM 18 Snips & Comments by others! I tried to do two plain borders...honest I did! 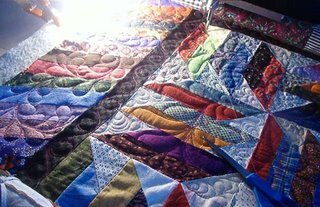 I got the first one on, fine....I used a black on black check for the inner border...It really set off the center I thought, but nothing that I laid outside that black border had enough color for the rest of the quilt! So..back to the sewing machine. I'm not crazy about piano key borders...but I always wanted to try an angled strip border, like the ones on an amish style "Joseph's Coat" quilt. I wanted to limit the bias as much as possible, so I cut mine with a 60 degree angle instead of a 45 degree angle....and I used up a gazillion more strips, though you wouldn't know it by looking in the bin. I have come to realise that looking in my strip bins is like dealing with another night of "left over casserole" from the fridge. It's time to start slicing into some yardage to spice up the mix a bit. I have a lot of red/blue/purple/black..but bright colors like yellows and oranges and lime greens or hot pinks etc...I think I've used them all up! 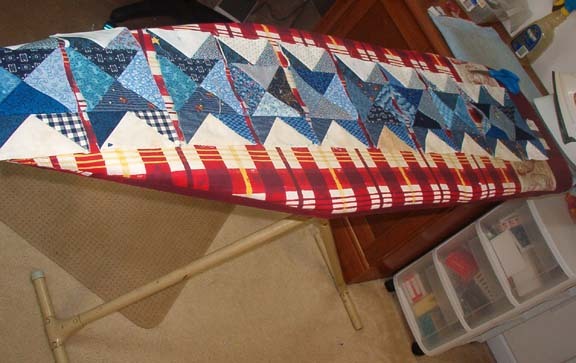 This quilt really IS a scrapbuster! Quipped by Bonnie K. Hunter at 8:06 AM 14 Snips & Comments by others!